TOKYO –Nikon Corporation is pleased to announce the release of a genuine Nikon set of four nickel-metal hydride (NiMH) rechargeable batteries, Rechargeable Ni-MH Batteries EN-MH2-B4, and a retail set that includes the Battery Charger MH-73, for charging sets of four nickel-metal hydride rechargeable batteries, and one set of four Rechargeable Ni-MH Batteries EN-MH2-B4. 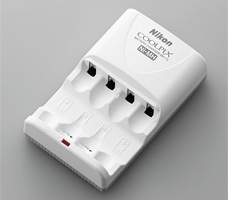 In addition, a firmware update for the COOLPIX L100 (supports four AA batteries) that adds support for nickel-metal hydride (NiMH) rechargeable batteries will be released to coincide with release of these new sets of Nikon NiMH batteries and dedicated battery charger. Please look for information regarding acquisition of the firmware provided by companies or shops selling the camera. The Battery Charger MH-73, which allows for simultaneous charging of sets of four batteries, is the perfect companion for the COOLPIX L100 with added support for nickel-metal hydride rechargeable batteries. 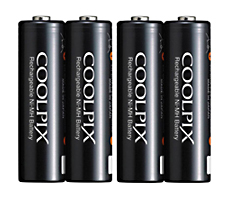 Released in March of this year, the COOLPIX L100 supports AA batteries that are easily acquired anywhere. 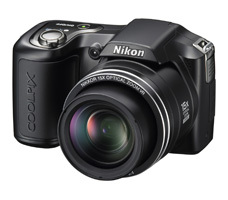 This convenience has made the COOLPIX L100 an extremely popular digital camera. The added support for nickel-metal hydride rechargeable batteries not only reduces the burden on the environment, but further increases the practicality of the COOLPIX L100 by increasing the number of shots that can be taken with a set of fully charged batteries. Nikon will continue to respond to the demands of its customers with services and products that offer ever increasing ways of enjoying digital cameras.